University of Wyoming doctoral student Adeline Borti arrived in Laramie earlier this year with not only a goal and a literacy education research agenda. She also arrived and a few months later, she won an international award with financial support from a highly competitive American Association of University Women (AAUW) 2016-17 International Fellowship. The prestigious AAUW award supports Borti's living expenses during her first year as a Ph.D. student and a Graduate Assistant in literacy education. AAUW selected Borti and other fellows based on their academic achievement, scholarly promise, and demonstrated commitment to women and girls; Fellows are expected to not only pursue their academic goals, but to be change agents when they return to their home countries. Borti's existing record of impacting the lives of women and girls in her home country of Ghana already is strong. Recognizing the importance of literacy for women and their historic lack of access to education in Ghana, Borti established a literacy group in her husband's church. Participants were invited to participate in literacy groups depending on their existing skill level, basic or intermediate, receiving instruction and support. "That project built their confidence," Adeline says. "Because English is our second language, people feel disadvantaged if they are not able to read and write and communicate in English." Like their daughters and peers, these women lacked the access to education as girls, when family resources were limited. "Most families will want to spend on their male child to go to school, if there is need for sacrifice," she says. "Most of these women face that challenge because they were not given the opportunity." That leaves women at a disadvantage, as most public documents and public processes (e.g., Ghana's parliament) are conducted in English, a language traditionally not taught except in school. It limits access to even essential information. "It cuts you off in a way, because you are not able to understand basic information that you should be able to understand - like road signs, prescriptions for medication and written information children bring from school," Adeline says. The chance to continue that work, and to create new opportunities for women, girls, illiterate population and struggling readers, is one of many reasons Borti chose to pursue a Ph.D. in curriculum and instruction/literacy education at UW. The degree is a necessary credential to fulfill a professional goal of returning to a Ghanaian university, where she will focus on literacy education in teacher preparation. It also provides an opportunity to conduct research to not only inform Adeline's future teaching but also context for the programs she wants to create as a volunteer when she returns. In addition to creating and staffing new women's literacy groups, Borti already has one specific plan to change the lives of children. "I'm looking forward to not only having literacy centers but also reading rooms, stuffed with books," she says of her larger plans when she returns to Ghana. "Especially for average and below-average income families, the children don't get access to books to read," she says, which becomes a disadvantage to the children's academic and social development. Borti already is laying the foundation for this program, while pursuing her own educational dreams. One major step forward is a 22,000-book donation from Books for Africa (http://www.booksforafrica.org/) that she needs support to ship to Ghana. Besides recruiting other book donations, Borti also will need donations to purchase book shelves and other necessary supplies, as well as donors to help staff the reading rooms. While Borti is in the early stages of her doctoral program, she already has a firm grasp of the focus for her dissertation. "I want to look at teachers' perceptions about child literacy development," she says of her research plans. "How do pre-service teachers think about child literacy development? Do they know and understand how children develop literacy?" Deepening her understanding of pre-service teacher preparation, specifically the gaps between what they know and that they need to know about early childhood literacy, will fill another gap at home. 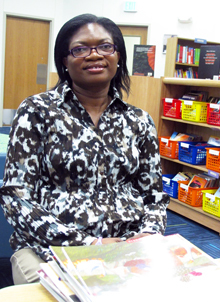 "In Ghana, a lot of focus has been on in-service teachers, how they teach in the classroom," she explains. Bringing in new knowledge about what is needed before they enter the classroom will be a contribution to the field there. Borti credits UW's literacy faculty and fellow students for making the introduction to doctoral work, and the UW College of Education, warm and welcoming. She also appreciates the graduate assistantship given her through the Literacy endowed fund. From the significant support that Wyoming Excellence in Higher Education Endowed Chair Vicki Gillis provided during a long and challenging visa process to doctoral students' willingness to share experiences and resources, Borti has found help launching her degree program. "The collegial atmosphere here is awesome," she says.